Next topic on the blog is Security policies. An important part of firewalls is controlling of traffic. Once we logically define zones and we segregate the network we need to control traffic to and from these zones. It is important that we know what we want to achieve from the outset. Once we have a clear goal in mind we can then proceed by using a hierarchical process to define out terms, group them, then apply them. I have taken the habit of getting an A5 notepad and writing out policy after policy. Creating address books, address sets, custom applications, and application sets, I have been able to grasp the syntax and learn it pretty quickly. As with most things Junos, unlike ASA, it lends itself to a logical format. I am going to outline two policies here that I wrote down from a random list of requirements. This is for a video editing company. Emphasis is learning policies backwards. Create an application set named Editing_ProFX_AS that references the above protocols and includes HTTPS, TFTP, SSH. Create a policy named ProFX_to_Media that puts this all together. Apply a scheduler called ProFX_Business_Hours that permits Editing to Media only to be active Monday to Saturday, 0600 – 2000 hours. In a new Policy, The network 172.16.32.0/24 must be denied at all times with the application set defined prior. You are also required to log the start of attempted sessions and count attempts. Lets break this down and begin creating. Once you stay planning what you require it gets much easy. Firstly, it is important to know that you can create address books globally and on a per zone basis. I prefer per zone basis as it gives you a more concise control without exposing objects to other zones. If you are re-using objects across many zones numerous times then maybe Global Address books will suit. Lets start by defining out address book and compiling some address sets. Firstly, Address book entries. 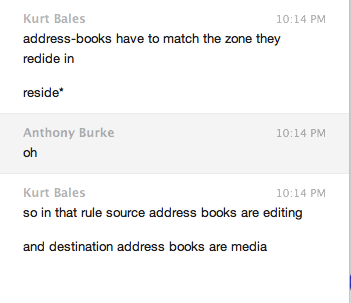 Note that our destination network MEDIA_10.23.84 is actually in the zone address-book of Media. More on that later. Now lets create those ProFX applications we want to allow. We then need to assign them to an application set. Now to create and assign the scheduler to the policy required. One of the requirements is to monitor and track failed attempts into Media from Editing. Let us create a second policy. This policy is 24/7, not confined to business hours like the previous policy. Address or address_set (MEDIA_10.23.84) not found. I was thinking maybe if the destination network wasn’t in the routing table or something funny it wouldn’t commit it. After thinking and looking around at my references my hunch turned out to be wrong. Kurt Bales was able to decipher this for me very quickly. After the pros and cons of Global address-books vs per-zone address books he explained something my sponge of a brain overlooked. Success! Problem solved. So as you can see it is quite a methodical process creating Policies. The important part is that you think about the requirements. Imagine yourself as the SRX and treat each arm as a zone. Use that logical and you will succeed. Thanks for reading and I hope this has been informative. Why didn’t you choose to use global addresses and address-sets? In that way you could later use them in the NAT rules, etc.. Any reasons?